You are here: Home » Gold and Silver » What will Happen if Gold is Used as Money? Lately, a lot of buzz, cries and shouting out there that the world should go back to using gold as money. The purpose of this article is to show what will actually happen to us, to our ‘gold money’ if gold is actually being used as money, to replace our existing fiat paper standard. Let’s assume that we started to use gold as our money beginning in 1996, which is exactly 15 years ago. First a little bit of history. Gold was widely used before but was removed by our grandfathers. Perhaps today’s generation forgot as to why gold was removed. Gold was found to be inherently unstable, difficult to be used as money. So it was removed and replaced with a better kind of money, our existing paper money. Paper money was so successful, it was the most successful kind of money ever. It is cheap, easy and almost counterfeit proof. Gold money possesses none of those ideal characteristics. Now on to gold. In order to get the true value of gold, independent from the changes in paper money’s value due to inflation, we have to filter out the effects of inflation on gold. Once removed, the mask that hides the true value of gold will disappear, revealing the actual price of gold, its true price, due to its own supply and demand. The graph is shown below. As you can see, the changes in the value of gold, is erratic and wild! Imagine the gold you have, the coin you are carrying with you, lost 50% of its value within the same year (paper money lost at the most one to two percent a year). If that happen, the prices of all goods and services you need to purchase, will double! That’s ridiculous! But that is the truth! For paper money, losing a percent of its value is only losing 1/100 of its initial value. But not for gold, it is a loss of 50/100. That’s 50 times more folks. Well, looking at the graph, how would you imagine you are going to manage your finance if your income goes down 50% in a year? Can you pay your existing mortgage? Your car? Your food and other expenses? After declining 50% in a year, then gold can go up, significantly. Suddenly things will change. Goods shortages will occur because there are more gold out there chasing fewer goods. It will be crazy and wild gyrations, year in and year out. This is not a joke, or a simulation, this is based on the ACTUAL price chart of gold over the past 15 years. If you care enough to find and analyze at the data longer than 15 years, the gyrations will be even crazier. 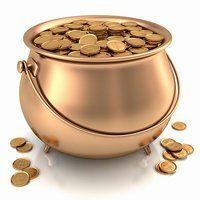 Think your gold money cannot drop by a massive 80%? In a few years only? Yea.. Think Again! It does and did happen. Paper money may decline in value over multi decades, but it is never quite like what gold can do. Gold is in essence, the bad boy of money. Now, for the second part, let’s take a look at the inflation rate of the United States, from the year 1996 until 2011. The inflation rate was very stable. What it means is that the purchasing power of your money is stable. It decline slowly over time, but not much every year. Besides, every year, everyone tends to make more money than the last, so the lost in purchasing power is properly compensated. Looks like our grandfathers were right all along to remove gold many decades ago. Since removing gold, our world had prospered. If gold is reinstated, I think it will bring massive dislocations within economies of the world, frequent crashes and eventually, meltdown. Remember the Great Depression anyone? I don’t think anyone did, because only your great grandfathers will remember because you were not born yet. Malaysia’s GDP only declined by 6% or so in 2009, can you imagine if the GDP declined by 25%?? What will happen to you and your family? That’s what happened during the Great Depression in the 30’s. It was caused, by none other than gold. The following is a table of your salary, from 1996 to 2011, payable in actual gold money. Say your salary started at 10 shiny gold coins in 1996, do you know what will happen to your salary after 15 years under the gold standard? Your 10 gold coins salary will turn into 1, I repeat, only 1 gold coin because there is simply not enough gold to go around. Did you wonder why gold’s price is so expensive right now? It is because of supplies shortages! I don’t know what you will be able to buy with only one gold coin left and God knows what happen to prices of all goods and services out there at that time. By the way, forget any salary increases folks, you are not getting it, you will only get less…and less. Sharif Rahman is the author of this article. He was invited by 1-million-dollar-blog to present his view regarding gold as money. He is the co-author of the recently released 259 Trillion Vs 5 Trillion book series (available in Amazon), presenting the banking system in action in full color illustrations and answering the popularly raised question of whether banks print money out of thin air and other questions such as exponential growth of debt and interest. 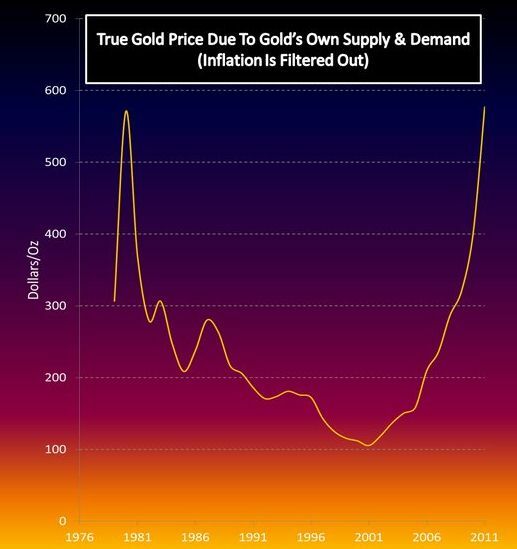 He pointed out that gold’s price started to go up back in 2005/2006 and therefore way before the Financial Crisis, so that did not caused gold’s price to go up, the supply and demand of gold did! Today Morning Breakfast on NTV7 invited a expert talking about gold, he actually advise us to hold and observe the gold price first, the price might be gone down further. I consider myself to be fiat-money supporter. One thing I do need to point out is an argument that gold advocates frequently use. The gold price is dollar-based, it could have easily been the dollar depreciating and not the gold price increasing, even if you adjust it for inflation. But I believe, without any statistical support, if you really do compare the gold price in different currencies, it will still be increase over the recent years. Which could hurt our export-intensive economy. Basically our manufacturing cost becomes so expensive that foreign investments start to move out to countries with that is cheaper. Another thing is gold price changes not only according to the demand for its practical uses such as in jewelry and semiconductor, it also changes according to the demand for its traditional role as a hedge against inflation. Also let’s not forget about speculative trading in gold. IF the hedge against inflation and speculative trading can be eliminated, the gold price will be probably be more stable. This of course will only happen if the whole world adopt the gold money. Imagine if only Malaysia adopts the gold money standard, our (new) currency will be as volatile as what Sharif Rahman has described. Gold money would have worked in a small-scale, closed economy (such as N.Korea, maybe) but not in an internationally-involved and export-intensive emerging market like Malaysia. Yes the 500% price swing from 1980 to now is not a “gold problem”. I was a “dollar” over printing problem. Price swing? ok 5 gold coin for one medium size cow. No body can simply print more gold coin to buy the same cow. So no such problem as 200 US dollar for a cow one day and 500 dollar one year later becaUse of QE2. iN fact seller may want to let go at 4 gold coin unless buyers can “print” more gold. having said that, gold is not easily “usable” as paper money. Well as in fiat money, we can pay our bill by credit card, denominated in gold coins. I am the writer of this article. I would like to thank the webmaster for inviting me to share part of 259 Trillion Vs 5 Trillion massive research data and findings. Our findings showed that stopping the hedging of gold trading will further increases volatility, instead of the expected reduction. The reason is simple, if there are many genuine buyers in the market as well as genuine sellers, the market will be very ‘sticky’. Price movements are difficult, however once it moves, it will move big time. A lot of people will suffer during such an event. There won’t be an orderly movement because the last purchaser of that gold, will be pushing the price up so fast, in a desperate bid to buy. Imagine the price of water, in a water market. Imagine that there is a supply shortage, and the last water bottle is about to be sold. There are two buyers left, without a bottle. They will quickly bid up the price through the roof, because it is a life or death for them. This will catch the market off guard, prices will not simply tripling or quadrupling, it will be much more. That’s really volatile, mind you. Immediately afterwards, water will suddenly be selling at that newly elevated price, as everyone suddenly demanding and expecting that new price to be the market price. The workings of the hedging industry can be studied extensively, it is indeed an interesting study. If N. Korea uses gold as their money, the country will stay poor, longer. A substantial part of their wealth, will need to be given away to foreigners, because they hardly produces any gold of their own. In our book, co-authored with Amy Norwood, we calculated that in order to produce gold money worth USD100,000, USD81,250 of the money will need to be used to pay the gold supplier, leaving only USD18,000+ left for the government for its spending. In contrast, it will cost the government only USD0.09 (that’s 9 cents only!) for the government to print a USD100,000 paper money. The difference, and the savings, are indeed tremendous! North Korea will do better if they stick to paper money, or they will become even poorer. 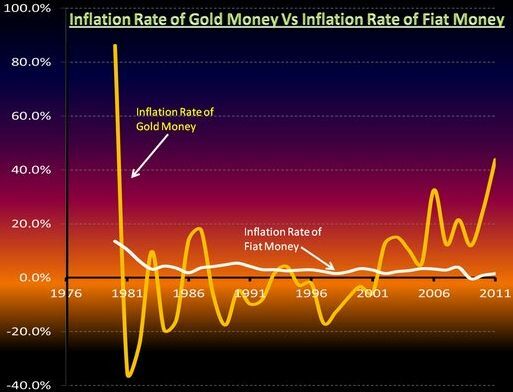 The article clearly stated that there are no fiat money around, only gold money is around. The reason salaries will need to be paid in less gold is simple, there are simply less gold, per human population. We have a chart which we include in our book no. 3 (to be published in Feb 2012). It is not easy to find this chart, so we had meticulously unearthed the data and plotted it for everyone to see. The amount of gold, per population is indeed shrinking, signaling that everyone, will be paid, less and less, not more. It does not matter the comparison to the US Dollar, it is a mere comparison for ease of understanding, where we removed the effects of inflation from skewing the data trend. Once removed, the gold supply and demand prices revealed itself, leaving us astounded. I am sure you guys do too! The shortage was acute, and it was before the financial crisis even around the horizon. Without the financial crisis, gold will still go up significantly, because there is a shortage. My reply is this, if a worker would like to still receive 10 gold coins every month, and not 5, then I am sure there is another worker who would also want to receive 10 gold coins, but instead of both workers sharing the ONLY available gold between them (5 each), one of them will have 10, but the other will have, ZERO. There are not enough gold to go around, remember? I guess the other worker will be fired. In fiat money system, the supply of money is practically unlimited, it is merely being limited by the central bank. As long as you do good work in the economy, you will deserve your salary, every dollar of it, and it won’t be less or reduced simply because there are not enough money to go around. Not so in a gold money standard, the central bank has no power to control the supply of money. Fiat money can be printed as long as it is being backed by the economy. Find out in book 1 and 2 of the series, we promise you, it will be an interesting read. (we gave away book 1 for free preview more than 100 free pages, go and read it!). As to over printing of dollar, there is no proof of this. Our data showed that dollar per person of the monetary base, for Americans, corrected for various factors actually declined from 1979 to 2010, there are less dollar printed. We presented this data, for the world to see in book 2 of the 259 Trillion Vs 5 Trillion book series. BTW book 2 ebook had just been published, the hardcopy will come out within this month. Regarding the cow, being sold with a price of 5 gold coins, imagine the supply and demand of cows. If supply does meet demand in the cows market, then the price will stays the same, at exactly 5 gold money. But what if, gold supply is not enough? The cows market which is staying in equilibrium, with supply = demand, there shouldn’t be price changes right everyone? But this will not be the case however. Because there are now less gold in the market, the price of cows will have to decline, say from 5 gold money to only 4. This is similar with the workers, salary, there is simply no gold to continue paying them 10 gold money each. But wait, despite the workers are now getting less salary due to shortage of gold, imagine if the cow seller refuse to sell his cow at 4 gold money? What if he still want to sell it at 5, saying it is not fair and it is his birth right to set the price to what he want. I guess no worker can buy a cow now.. I hope the impact of a simple change of gold supply, is now clear to everyone. Throughout history, this was repeated, over and over with great difficulties on many people. I have read the posted book by the author at their website. The first chapter is interesting. It help explains the misconception of assets vs money. Gold is an asset (albeit a useless non-wealth generating asset – farm land, factory, education is wealth generating asset). Paper money is in fact backed by these asset of the country. Why do people wants to limit money to one asset? Imagine a country with a lot of fertile land, cows and sheep but no gold.Why should they give their food and backbreaking work to gold seller (miners) just so the government can distribute gold money to use for transaction?? So that the citizen can trade with each other (buy good and services). Why can’t the government just print money based on these wealth and the people can trade among themselves and not give their hardearned wealth to ‘gold diggers’ (ehem…gold miners)? Seems stupid to me. The authors made a really convincing argument about this. I also have read a lot about gold money proponent. Many just harp their “ultimately pricelesss” gold but forgot to calculate this effect on many countries who don’t have much gold. Even Malaysia have little gold, not even enough for daily trade, let alone paying government servant salary for a month! As far as wealth goes, the gold people are the one not fairlah. Only gold has value. Other people backbreaking work has no value. Having land, orchards, cows and sheep is not wealth and cannot be use to back the creation of money. Only gold has value as money according to themlah. Not fair lah! Wealth is wealth. Assets are assets. Money is just money. U use money for buying things not to store your wealth. If you still confuse about these, you should read the book sample given free at the author websitelah. For me, the cow seller have the upper hand, and the cow seller will be damn mad that because of gold, his hard work of raising the cows are wasted..he will not want to sell it for less, maybe more lagi, 6 or 7 gold coin. The book made me understand that gold is not wealth, because the cow seller can set any price he want .. in fact the cow seller can refuse to sell the cow, for any amount of gold..seratus also he wont sell. The authors mentioned in their book, neither gold nor paper money is wealth…rasanya cow is wealth lorr, or padi farmer etc. Gold people need to eat too hahaha. That is gold price based on the usd. More gold means more tax/ zakat. No more leverage, no more riba’. Only a srong n smart khalifa will change it. Gold is a not a replacement in the fiat system. But it is a whole new system. By printing more money just like those PIIGS n US country. Mybe they can create bond but where they will get the mony to pay the interest. If the is already broke. Let prepare ourselves, have faith. As i said earlier, the gold price i had shown is not based on the movement of the US Dollar. It is determined according to the equilibrium price of the market, it can be expressed in dollar, pound, ringgit, chickens or anything that the seller prefers. It really does not matter. More gold means more wasted resources, it does not mean more zakat. The data for zakat collection for 2010 declined, instead of increasing, this is despite everyone bragging they accumulate more gold and kononnya paying their zakah. They are lying. We also confirmed that gold is not the solution to riba. In fact, riba was widespread during the gold period. Fiat system is unlikely to crash, because it is dependent on the strength of the economic participants. The crash was predicted some 30 years ago, but instead of collapsing, the world experienced economic booms unequaled in history of the planet. I urge everyone to prepare themselves with knowledge, first and foremost. I need not say much about nafsu, but it is proven yesterday, in Malaysian newspapers that gold hungry digger destroyed public roads, even when they know there is no gold there. They action costed the public RM20,000 in repairs. I calculated that those bunch of people will make more than RM20,000 in their 1 week long search of money, they will generate more for themselves and the country, and will end up richer by more than RM20k, if they stop digging and go and do something better, things that add value to society. So don’t think without gold no nafsu, in fact it is worse. If they know your front lawn has gold, no, has only heard of rumors of specks of gold dust, they will come and intrude into your lawn, give no care to you and your family. In fact they will kill you if you try to stop them. This I can guarantee, no need Khalifah2. A smart Khalifah will certainly throw gold away far, far away, Just like God commanded. Please have a look at all of the facts we included during the research of the book. Try go to nodirtygold.org to learn more about gold people destroying the world. the paper money it self does not have any value. y do u think the stock market crashed in 2006. the main reason being that the people who control the money in flow i.e. IMF, has full control over it and can print as much money as they want to lend it to the poor countries. who in return have to pay interest on it, and have borrowed the money in the first place to buy goods from the same people who lent them money in the first place. making the rich more and more rich and the poor more and more poor. second thing, the paper money itself has no value like the gold does. for example, 40 years ago, 200 indian rupees would be sufficient for monthly expenses but today it no longer is possible, the reason being the drop of value of the paper money, but if i had 200 gold coins 40 years ago the value of it is the same today, cos gold has the value in itself. it cant be printed by anyone. and because of the shortage its value will always increase. and the stats shown are wrong, the ups and down in the graph for the gold is cos its linked with the USD, the erratic ups and downs is cos the value of paper money is not stable. not cos the value of the gold.